President Trump was correct in pulling back the security clearance held by former CIA Director John Brennan. It should have happened under Barack Obama. Former CIA Director John Brennan has weaponized national security status and has uncharacteristically been on a mission trashing the Trump administration while defending the Obama administration and its meddling in the 2016 presidential campaign that included trying to place a spy inside the Trump campaign. I say uncharacteristically because most of his predecessors who left the position faded into anonymity rarely to be heard from again. In fact I had to go back and look up the last few people who held the position going back to 1981. They include William Casey, William Webster, Robert Gates, James Woolley, John Deutch, and George Tenet. Other than Robert Gates who went on to become Secretary of Defense in the George W. Bush administration, I am willing to wager that most people could not tell me what those men are doing today. That has been the pattern with former CIA directors. They serve and fade into obscurity. But not John Brennan. 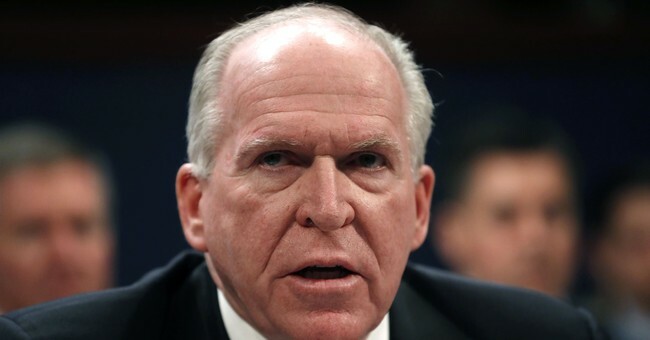 John Brennan is working overtime using an anti-Trump agenda driven liberal media platform while claiming to be protecting the reputation and integrity of our intelligence agencies that have come under scrutiny since it has been exposed that they may have engaged in political hi-jinx or worse, colluded with the FBI to subvert the will of the people in choosing Donald Trump for president. What makes Brennan’s actions particularly disturbing is that he portrays himself as apolitical but that does not line up with his past behavior. John Brennan is anything but apolitical. One news story reports that former CIA officials who worked with him called him a political animal. He worked on Barack Obama’s 2008 election campaign for president serving as Obama’s intelligence advisor. He rarely mentions that and the liberal media never brings that up in introducing him for full disclosure. He also defended the CIA’s use of one such Enhanced Interrogation Techniques-waterboarding-but that didn’t stop MSNBC from hiring him as an intelligence analyst even though they staunchly opposed the use of EIT’s during the Bush administration. Right now he is serving as a useful pawn for the left in attempting to delegitimize Trump’s presidency. Yes, Brennan has a dog in this fight. In a recent op-ed, Brennan lectures us on how he is simply protecting the American people and the federal government from Donald Trump, as if it’s his duty. He said that, “Presidents throughout the years have differed in their approaches to policy, based on political platforms, ideologies and individual beliefs. Mr. Trump, however, has shown highly abnormal behavior by lying routinely to the American people without compunction, intentionally fueling divisions in our country and actively working to degrade the imperfect but critical institutions that serve us. He further wrote that, Many have condemned my public criticism of Mr. Trump, arguing that as a former CIA director, I should bite my tongue. My criticisms, however, are not political; I have never been and will never be a partisan. I speak out for the simple reason that Mr. Trump is failing to live up to the standards that we should all expect of a president. Thanks Mr. Brennan but we did not ask you to do that on our behalf nor were you elected to any office to speak for the American people. As for lying, John Brennan has his own integrity gap issues. He has been caught in several lies including in 2014 where he denied to Senator Dianne Feinstein of the Senate Intelligence Committee that the CIA secretly monitored the computers of congressional staffers. In fact he said, “As far as the allegations of CIA hacking into Senate computers, nothing could be further from the truth.” Later that summer Brennan apologized to the Senate Intel Committee and admitted that the CIA did in fact look at Senate staff computers. The Washington Post and other liberal media called for then President Obama to fire Brennan over this. Today, in an about face, they circle the wagons around him. Brennan faced no consequences for lying. His clearance should have been revoked then but once you are accepted into the D.C. club of political elites, you become a protected class with a lifetime membership. If one connects the dots, it is easy to surmise that the CIA under Brennan played a significant role in promoting the Russian collusion in the 2016 election story, including Brennan briefing President Obama that in his opinion, Putin was trying to help Trump win yet he had no intelligence estimate to suggest that. No one else in the Intelligence Community shared Brennan’s analysis. It is time to reorder who exactly needs a national security clearance and why. It should be based on a need to know. Former government workers rarely have a need to know. Brennan threatening to sue the President over his revoked clearance is typical of his arrogant entitlement mentality. A security clearance is not a right, it’s a privilege that can be revoked by the commander in chief at any time. He doesn’t need a reason. He did it in the interest of national security. It has been reported that 4 million people hold a national security clearance and 1 million have top security clearance status. Someone in Congress needs to ask why. If that many people have access to national secrets then how safe are those secrets? How many of those holding security clearance no longer work in government? People leaving government maintain security clearance for economic gain and status. Nothing else. That status gives you a leg up in applying for government grants, non profit start-ups, jobs in the private sector and book deals. That needs to end. No one should be able to monetize prior government service by holding onto a security clearance. When you leave government, your security clearance should end short of some non anecdotal reason to maintain it. John Brennan is certainly free to engage in raw politics. He can do it now with a clean break from his prior government service.